John G. Ibe was involved in the early stages of securing additional space in San Diego County for what would become the Miramar National Cemetery. He worked very hard in this effort and was a prime mover in getting the facilities located, funded. He was active with the early stages of the Fort Rosecrans and Miramar National Cemetery Support Foundation, serving as a Chairman until his death in June 2006 at age 86. Mr. Ibe was born on December 18, 1921 in Sheboygan, Wis. In 1943, he enlisted in the U.S. Navy as an apprentice Seaman. He was a WWII combat Navy veteran who served aboard the USS Saint Lo CVE 63. He survived the sinking of his ship at the Battle of Leyte Gulf off Samar, Philippines on October 25, 1944. His was the first ship sunk by Japanese Kamikaze pilots. 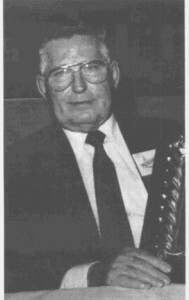 In November 15, 1945, he was honorably discharged in Bremerton, Wash.
Mr. Ibe was one of the founders of Taffy 3, a Navy veterans group, and for many years was the driving force in many charitable programs. Some of these in San Diego included the erection of the US Aircraft Carrier Memorial on Harbor Drive, the Taffy 3 monument at the G Street Mall, the USS San Diego monument, the Bob Hope military tribute, and the Navy Homecoming statue. He chaired the commissioning of the USS Pearl Harbor; and at Fort Rosecrans National Cemetery, five monuments were erected to memorialize the 894 men killed in action at the Battle of Leyte Gulf during WWII; as well as the installation of an outdoor chapel sound system, which sounds Taps at the close of every day.